Christmas is just around the corner, and this year I’ll be spending the holiday in Eastern Tennessee. I doubt that it will be the “White Christmas” of song – temperatures have been just a bit too warm for snow – but it’ll be spent with my dad. The family as a whole – mom, dad, sis, niece, dog, and me – is celebrating Christmas a few days early, with my mom traveling back to Memphis to spend several days (including December 25th) with her daughter and granddaughter. When family members live in other parts of the country or state, it’s challenging to coordinate the logistics of getting everyone together. And I say this having a small family! Anyway, I’m sure many of you can relate. I am a sucker for nostalgia, and I often spend time that should be dedicated towards, say, finding a job, gathering proverbial wool or thinking happily of days gone by. As such, I thought I’d continue my series of “Holiday Travels” entries with another bit of fond musing. If you’re curious, my previous post in this series was last December’s Québec City and Montréal entry. I hope you’ll give it a read; the “Related” section at the bottom of that post should then direct you to older entries in this series. 2006 was an epic year for yours truly. I had the best financial year of my life and a generous vacation allotment, resulting in several terrific trips. Mexico, Turkey/Denmark, Singapore/Malaysia…it was grand. As the end of the year rolled around, I hankered to experience my first New Year’s Eve in Europe, but also remembered that I hadn’t visited my parents at all that year. My vacation time was wearing thin, so I finagled something brilliant: four days in Memphis, three days of work back in LA where I lived at the time, and then six days in London. Exhausting? Sí, señor. Christmas in Memphis was a short affair, but I enjoyed every moment. My niece, just three at the time, was a lot of fun. Additionally, I took my parents to the Brooks Museum of Art, which features a nice collection of little-known artists. Before I knew it, I was back on a plane to LA for an end-of-year work wrap-up. Historically, that last work week of the year is always the slowest, but my presence was requested and what little there was to do was handled with ease. Today, the stubborn person in me would criticize my boss for making me come back at all, but back then I recognized that I had taken a good amount of vacation time and I didn’t want to abuse the privilege. On the 29th I took the last flight of the day to London-Heathrow (LHR). 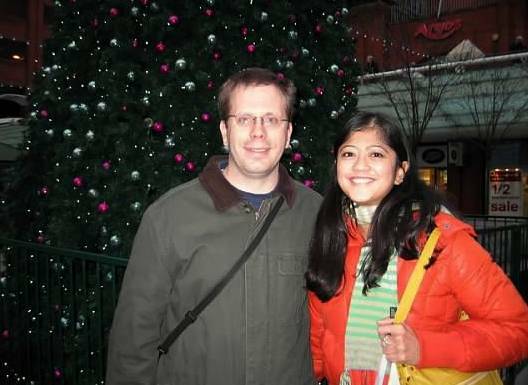 I arrived in a jet-lagged state – as I often did when flying to Europe – but bought a coffee upon arrival and met one of my then-Eurotrek friends, Hope (not her real name), in the residential neighborhood of Ealing Broadway, where she happened to be spending the holidays with relatives. We went for a stroll and, to neither person’s surprise, arrived at a pub. We didn’t linger for long, as she was heading back to the U.S. the next morning while I was fighting sleep deprivation, but it was good to meet up with a friend who knew the city better than I did. Alas, we are no longer in contact. I shall chalk that up to people growing apart. For my part, I’d love to resume our friendship, but I suppose it’s true that some people aren’t meant to be in your life for long. My hostel, The Generator, was a noisy party hostel that had multiple bars, a gazillion types of beer on tap, electronica blasting until the wee hours of the morning, and lots of dark corners for groping…but little care wasted on the dorms themselves. This place received top marks on Hostelworld?!?! Fortunately, I was there for just one night, as my plan the next morning was to take the train to Salisbury, a large plains town that hosted the UK’s tallest cathedral. Salisbury looks lovely when decorated for the holidays. Tasteful lights are strung between lampposts that line the cobblestone streets, and half-timbered houses give the whole place an unmistakable British charm. It is small enough to be quaint and large enough to have some industry. In other words, it seems like the kind of exurb that Harry Potter might have grown up in. Salisbury has one other claim to fame: its proximity to the medieval sites of Stonehenge and Avebury. Stonehenge is just 20 minutes outside of town, while Avebury is perhaps an hour away, in Wiltshire. I had visited Stonehenge once before and decided to check out Avebury this time around. Although both sites are believed to be Druidic places of worship, at which circular series of stones harvest solar energy (or something like that), they frankly couldn’t be more different. Stonehenge can be visited in just ten minutes (although I recommend staying longer), and its stones are positioned close together. 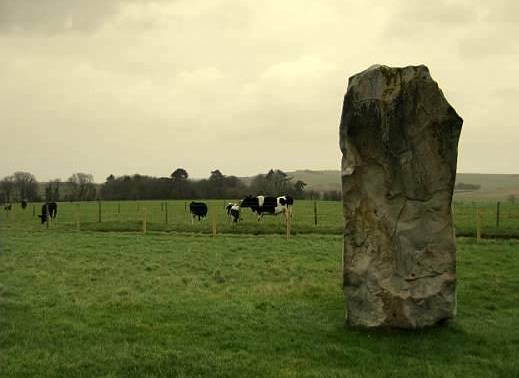 Avebury, on the other hand, sprawls over several hectares. It is a harder place to photograph, but then again, it attracts perhaps one-fifth of Stonehenge’s crowds, so it’s easier to find solace. Unfortunately, it was pouring rain and I couldn’t take nearly as many photos as I would have liked. I wandered down a country road to visit a Neolithic burial site called West Kennet Long Barrow, and was soaked to the bone when my bus back to Salisbury finally arrived. I don’t think I ever got all the mud off of my pants. After changing into dry clothes back in Salisbury, it was a delight to spend the evening wandering around town. Most British pubs outside of major cities have names like “The Fox and Hound,” “The Bloody Goat,” or “The Boar’s Nest,” and while I can’t remember for certain, I am certain that the place I dined at was similarly-named. Incidentally, my hostel, the Salisbury YHA, was all you could ask for in a semi-rural hostel. Lodging places often change in quality – and many times for the worse – but I hope this one doesn’t. I don’t remember my day-by-day itinerary from when I returned to London, but it generally consisted of exploring different neighborhoods and hitting up a few monuments that I had missed during my first visit in 2000. I stayed at a fantastic hostel in the Stamford Brook borough of London – a hostel that, sadly, is no longer in business. One highlight was taking the Tube and alighting at Tower Hill, the exit station for the Tower of London. I didn’t go inside, but it was a glorious sunny day, almost too warm for the ice skating rink that was operating along one of the outer walls of the Tower. 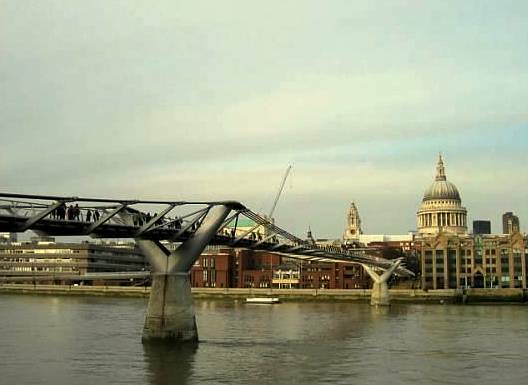 From there I strolled along the Embankment, past the Tate Modern and Millennium Bridge (with St. Paul’s Cathedral and the Gherkin Building – 30 St Mary Axe – visible across the Thames). I peeked inside the reconstructed Globe Theatre, then strolled past the London Eye towards Big Ben. I loitered there for awhile, taking shelter from another rainfall under one of the sidewalk overhangs. On another sunny morning I awoke early and enjoyed a long walk through Hyde Park. There was no snow and it was too cold for the park’s flowers to be in bloom, but I was able to tour Kensington Palace, former home of the late Princess Diana and current residence of the Duke and Duchess of Windsor (aka William and Kate). After leaving Hyde Park, I stopped off at Harrods of Knightsbridge, surely one of the world’s great department stores. A small memorial on one wall commemorated the lives of six people (including three police officers) who perished in a 1983 IRA car bombing outside the store. As I mentioned a few paragraphs above, I wanted to experience New Year’s Eve in a European city. I discovered that few destinations are better for doing so than London. 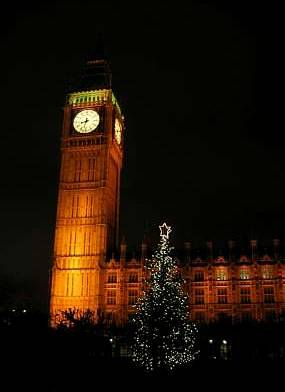 Nightfall arrives early on the 31st of December, but so does the festive atmosphere. Pre-fireworks revelers wander through the streets of Covent Garden, Leicester Square, and Piccadilly Circus. Open containers are allowed, even encouraged. I drank mulled wine on a lively street with one of London’s black cabs as a backdrop. Bobbies (police officers) linger about with smiles on their faces and nightsticks, not guns, on their belts. The Underground runs at no charge. As for the fireworks themselves, they are launched from the London Eye. I mean that literally – they actually shoot out of the Ferris wheel’s superstructure! Thousands, millions maybe, gather along both sides of the Embankment for the show. I was alone, but with friends. Even though London has more museums and places of interest than one can see over several visits, this trip wasn’t about checking sights off of a bucket list. Once I decided on London as my destination, I realized that it was a perfect chance to take a second look at the first European city I had ever visited. This time around, I paid closer attention to the neighborhoods, to the walk and the talk, to the way people dressed, and to that very Bri’ish way of just being. I ate in pubs, not chain restaurants. I interacted with the locals, not with my hostel mates. I stayed out of the souvenir shops. Saying this is not to sound snobby; I like chain restaurants, hostellers, and shopping as much as the next person. But for me, this trip was as authentic as I could make it. Despite the high-season lodging prices and chilly temps, I highly recommend checking out London over the Christmas/New Year’s holiday. My only advice is weather-related: days are short; the sun rises about 8:30 a.m. and sets around 4 p.m. Interestingly enough, each morning started out sunny, with nary a cloud in sight. By noon, however, the clouds started rolling in and most evenings saw rainfall in varying degrees of severity. Pack a brolly (umbrella) and get an early start to your day. What are your plans for this holiday season? As I said at the beginning of this post, I’m spending an early Christmas at my East Tennessee home with all the family in attendance. They arrive tomorrow! Ah, memories of Salisbury cathedral. I had a really memorable trip there. Did you know that it houses one of the only surviving copies of the Magna Carta?